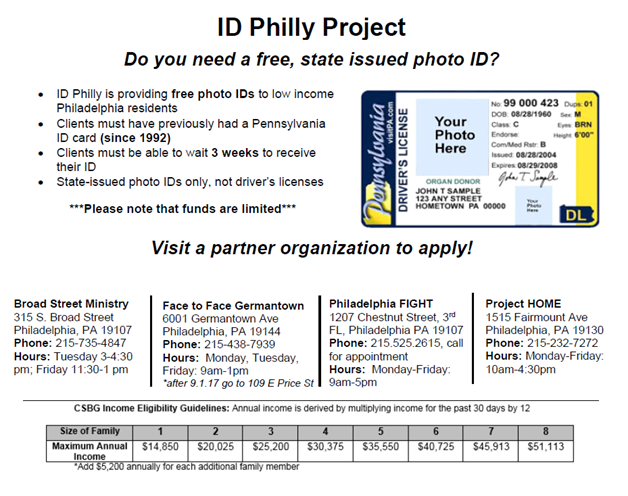 Do You Need a Free State ID? 3rd Annual Community Fun Day! Join your neighbors for the 3rd Annual 16th Police District Promise Zone Community Fun Day! 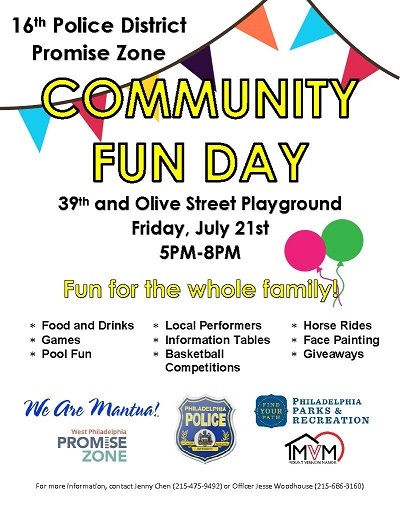 Come out for local performances by youth, horseback rides, resource tables, free hot dogs and refreshments, and a great opportunity to connect with other residents and our local officers. Home + Health Workshop Series in June! Join Mt. 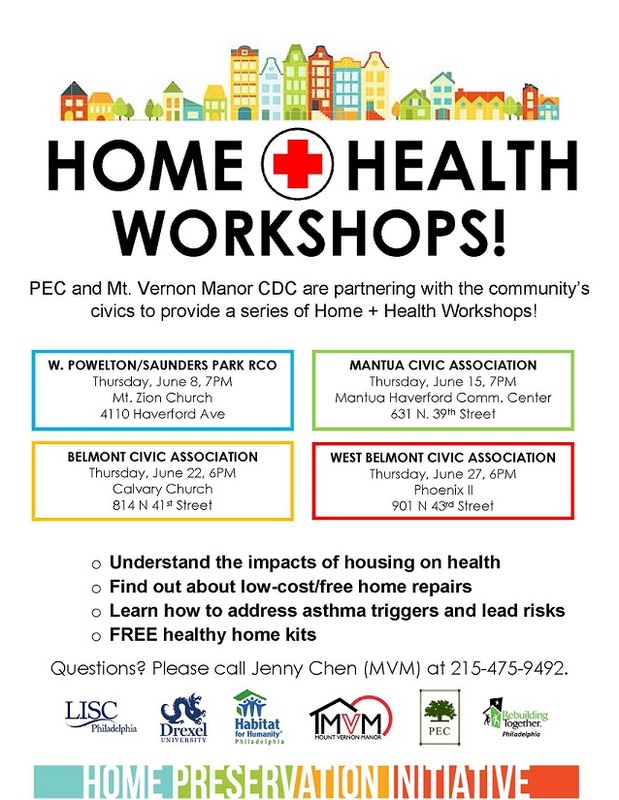 Vernon Manor CDC and The People’s Emergency Center for a series of Home + Health Workshops during the community’s June Civic Association meetings! See flyer below for details. Do you know where or what the deed to your property is? Do you have a plan to pass down the wealth of your home? If your answer is no or I’m not sure, it’s time to Get Your House in Order! Please join Mt. 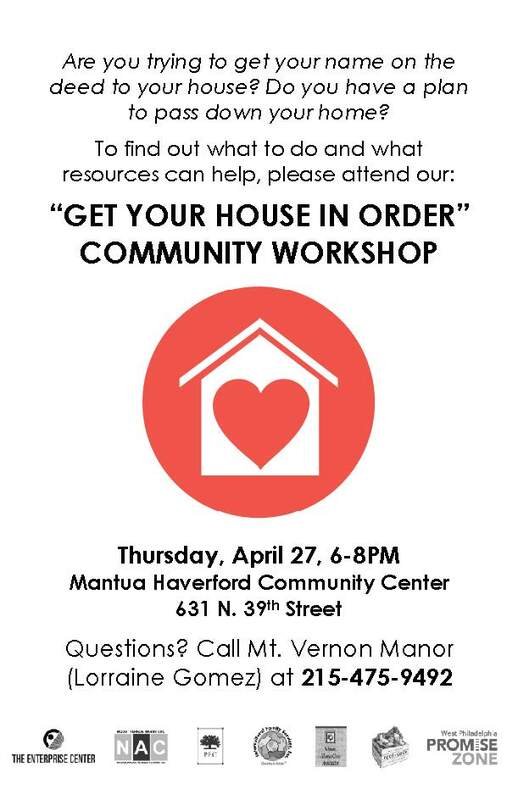 Vernon Manor CDC and partners on Thursday, April 27, 6-8PM, in the Mantua Haverford Community Center (631 N. 39th Street) for a Community Workshop that will help you make sure you legally own your home and protect your loved ones from facing similar challenges in the future. Questions? Please call Lorraine Gomez at 215-475-9492. Mt. 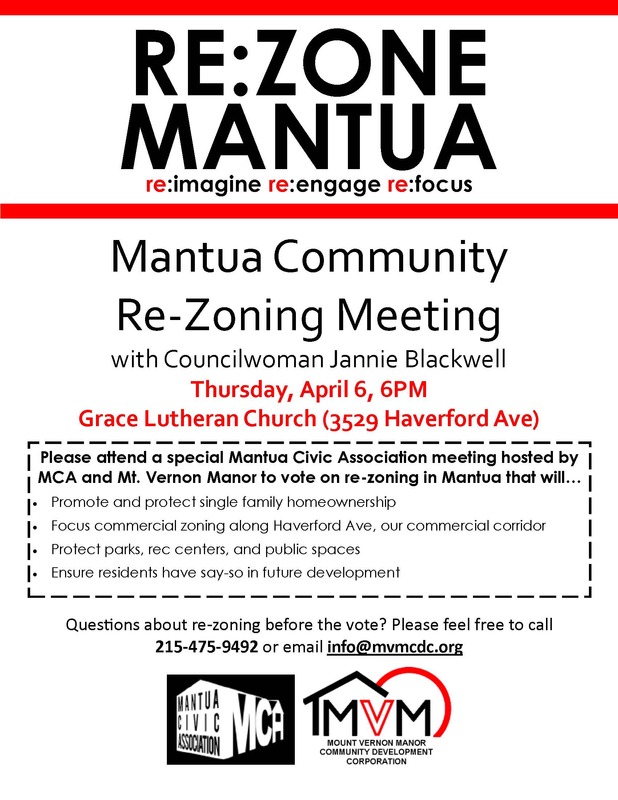 Vernon Manor and the Mantua Civic Association invite all residents to a very important Mantua Community Re-Zoning Meeting on Thursday, April 6th, from 6PM-7:30PM, at Grace Lutheran Church on 36th and Haverford! If you have any questions about what re-zoning means for your block, please feel free to drop by the Mt. Vernon Manor NAC office (631 N. 39th Street) to have your questions answered before the meeting. Please feel free to call 215-475-9492 with any questions or concerns about re-zoning! Mt. 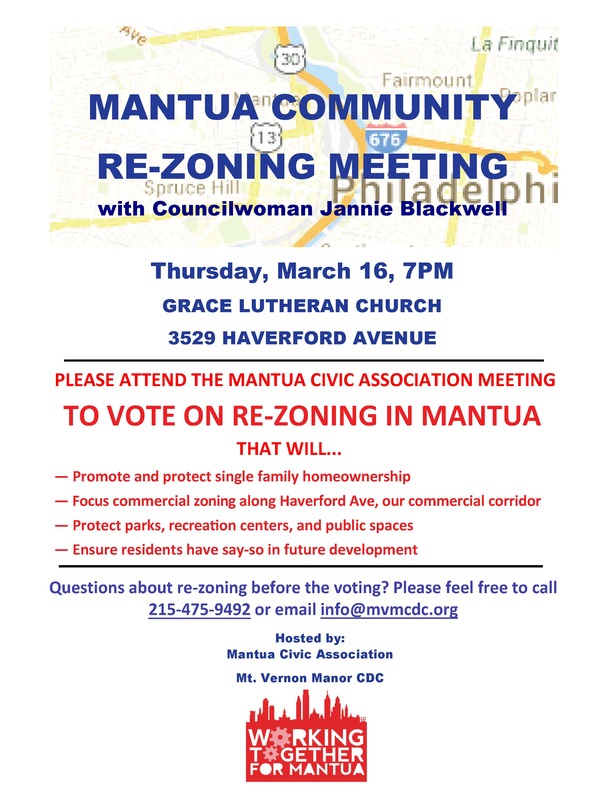 Vernon Manor and the Mantua Civic Association invite all residents to a very important Mantua Community Re-Zoning Meeting on Thursday, March 16th, from 7PM-8PM, at Grace Lutheran Church on 36th and Haverford. We will be meeting with Councilwoman Blackwell to demonstrate again our support for re-zoning in Mantua based on priorities that promote and protect single family homeownership, focus commercial zoning along highly trafficked corridors, and correct zoning for parks. If you have any questions about what re-zoning means for your block, please feel free to drop by the Mt. Vernon Manor NAC office (631 N. 39th Street) for 2 short info sessions on Tuesday, March 14, and Wednesday, March 15, from 5PM-5:30PM, to have your questions answered before the meeting. Please feel free to call 215-475-9492 with any questions or concerns about re-zoning! Join Mt. Vernon Manor CDC, the East Parkside Residents Association, Centennial Parkside CDC, and the Office of Emergency Management for a Emergency Preparedness Workshop! Get prepared with your neighbors, build a FREE Go Bag with emergency supplies, equip your household with weatherization supplies, and learn useful tips. Workshop will take place at Christ Community Baptist Church, 1224 N. 41st Street, on Saturday, February, 18, from 9AM-11:30AM. To register, please contact Lorraine Gomez at 215-475-9492. Mt. 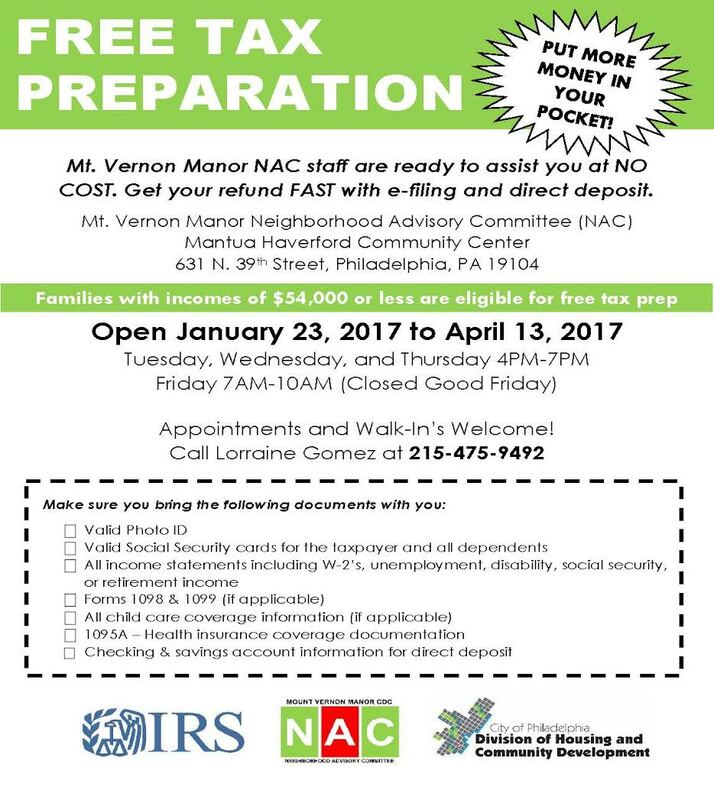 Vernon Manor NAC Tax Prep Up and Running! Mt. Vernon Manor CDC/NAC staff are ready to assist you with preparing your taxes and ensuring you receive your refund FAST with e-filing and direct deposit. Drop by or schedule an appointment between now and April 13, 2017, at the Mantua Haverford Community Center (631 N. 39th Street) by calling Lorraine Gomez at 215-475-9492. We are open for tax prep Tuesdays-Thursdays, 4PM-7PM, and Fridays 7AM-10AM. Mt. Vernon Manor CDC is issuing a Request for Proposals for consultant services to develop a 3-year strategic plan for our non-profit organization. Please click HERE for the full RFP. The deadline to receive proposals is Friday, January 27, 2017, by 4PM. Any questions should be sent no later than January 13, 2017 (4PM). Mt. 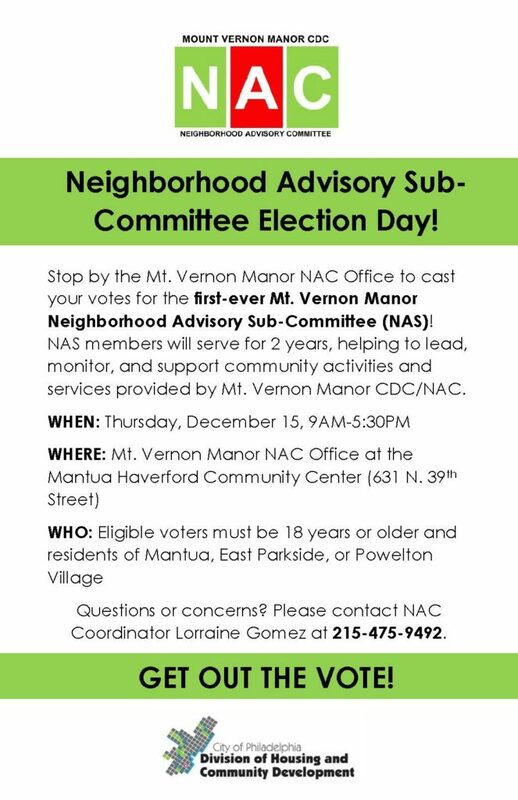 Vernon Manor Neighborhood Advisory Sub-Committee Elections! We’re just 1 week away from our first-ever MVM Neighborhood Advisory Sub-committee Election Day! Stop by our office at the Mantua Haverford Community Center (631 N 39th Street) next Thursday from 9AM-5:30PM to cast your votes for our 2017-2019 NAS members. Check out flyer for more details!